Usually this column is about restaurants and travel destinations, but this time around something a little different: I’m going to give you a complete night out that includes dinner and a movie. Let’s starts with dinner. 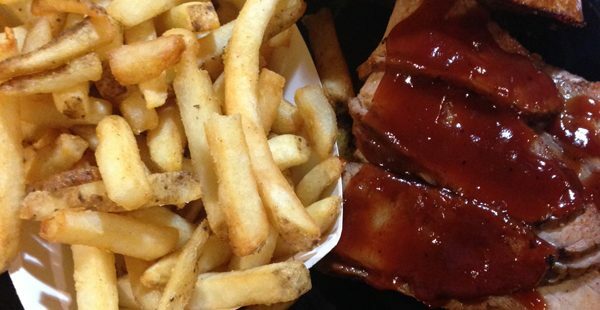 For that we’re going to Geb’s BBQ, which opened at 7205 Rutherford Road in Woodlawn in August 2015. The neighborhood consists basically of businesses, but don’t let that fool you. Once you get inside you’ll be glad you made the trip. 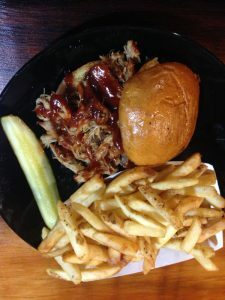 For one thing, Geb’s BBQ is locally owned. I must have said this 50 times, but to me a locally owned restaurant is a good thing. It means the owners are tied to the community and most likely spend most of their time making sure everything is working smoothly. The owners are Benny Gordon and his wife LaDena. Benny is no stranger to the Baltimore culinary scene, as he has been around the area for decades. His simple philosophy at Geb’s is to bring farm fresh food into the restaurant every day and serve it in a friendly atmosphere. Benny was kind enough to give me a tour during my initial visit – and I was amazed at how large the back of the house really is. It is one of the few times I can say the kitchen area is larger than the dining area. He explained to me all that room is necessary because Geb’s BBQ is tied into a school – the NCIA, where he teaches culinary classes. How lucky are those students who are being taught by a super chef. It’s kind of like Michael Jordan teaching a basketball clinic. Some of the students actually work at the restaurant. Geb’s is open weekdays from 6:30 a.m. to 3 p.m.
the waffle. When you enter you’ll read three menu boards listing the daily items and the specials. Then you’ll give your order to a kindly person at the cash register and then be seated. Your food will be brought to you. When ordering your lunch, and there are many selections, but I will mention the brisket, pulled pork and the popular ribeye steak sandwich as suggestions. If omelets are a favorite, try the crab or cheese. The specials change with the season and in October restaurant hours will be expanding. Geb’s is the result of a vision Chef Benny had long ago. Of course, starting a restaurant is no easy task., with the first step being finding a location. You can imagine how many other decisions had to be made. It’s too early to tell, but it appears as if things are in place for a successful run in Woodlawn. You can reach them at 410-298-4634 or by going to gebsbbq.com. This is the story of what is called ‘the miracle on the Hudson,” in which a passenger plane flying out of LaGuardia in January of 2009 was hit by a flock of Canadian geese, basically putting both engines out of commission. The pilot was Chelsey “Sully” Sullenberger, who landed the plane in the Hudson River with all 155 passengers surviving. Sullenberger, who is played by Tom Hanks, was immediately hailed a hero but there was an investigation by the NTSB as to what really happened and could the water landing been avoided. If they ruled one way his career as a pilot would have been over. The 96-minute movie is the shirtest film Clint Eastwood has directed. The acting and the special effects are terrific – you’ll swear you are watching the actual splash down. This is one of the best films I’ve seen in quite some time.